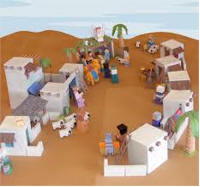 DIY - Miniature Bible Town fundraiser! organized in the Bible. The church had worked with missionaries in Mexico for several years, and the children decided to raise money specifically to build houses for the homeless in the area. In the spring, the children advertised in the church newsletter and displayed the Bible town on tables for everyone to see over a two-week period. The children hoped to make more than $100 by selling their houses. However, the result exceeded everyone’s expectations. When the kids explained how the money could specifically help families in Mexico, the donations for the Bible town houses began pouring in. They had so many people wanting houses that they had to make extra. The whole church embraced the project.